Many have warned that the Ring of Fire’s activity could produce a large enough earthquake to completely destroy the entire California coast. So far, nothing of the sort has happened, but new and violent volcanic activity is forcing the fear back to the forefront of people’s minds. According to The Sun, scientists are now sounding the alarm as well. Scientists have warned that the frequent seismic activity, which has already claimed lives, could mean a huge quake is on the way. 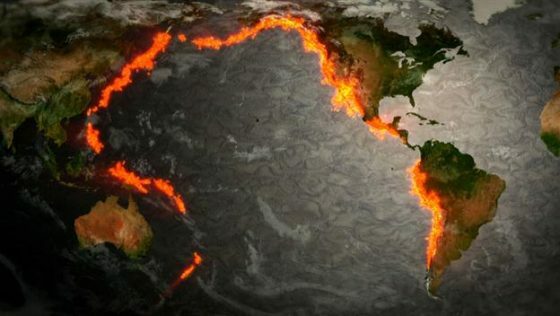 A new study out of California says that the cluster of tremors around the planet’s so-called Ring of Fire (the horseshoe-shaped geological disaster zone) could indicate the “big one” is due to hit, TheDaily Mail Online reports. More than 180 people were injured and 17 people killed when a 6.4 magnitude quake struck Taiwan’s east coast on February 6. On Tuesday a series of tremors reaching magnitudes as high as 5.7 shook the US island territory of Guam. Since February 11, three earthquakes have hit Japan, the largest measured at 4.8 on the Richter scale and was 103 kilometers from Hachijo. While some scientists look to discover the possibility of an unexpected “big one,” many others are urging the public to remain calm and not be concerned.